START HERE — BUILD. DESTROY. CREATE. First time visit to ARTB online? If you’re already familiar with our activities, feel free to skip this introductory page and proceed to the SHOP tab in the menu where books can be searched by instruction set, series, age, and title. If you’re new to us, Hi! ARTB is an extensive set of exercises and activity books designed to develop fine motor skills, creative confidence and self-efficacy. Due to the design principles of our book series, these activity books can be appropriate for children as young as 2 years old. Activities in this tutorial focus on the first skills: Tearing and Crumpling. Why tear and crumple, you ask? Tearing paper can be fun and satisfying to older babies and toddlers. The act of tearing encourages useful finger and coordination skills. In order to tear paper, one must learn to hold the paper between the thumb and pointing finger of each hand. Then one must move each hand in a different direction to tear the paper apart successfully. IT’S QUITE A CHALLENGE! As a child improves their control over this action through practice, they will be better prepared for more refined activities. At ARTB we know that children must learn to treat books and paper items with care and respect. By having special activities set aside with visible instructions for them that signal when and where to have the freedom to tear and crumple, the child can channel their energy in this developmental activity and learn when they can and can’t practice this useful skill. They also get to see exactly what happens to the page as it gets torn and crumpled up, rendering it used and no longer what it once was. 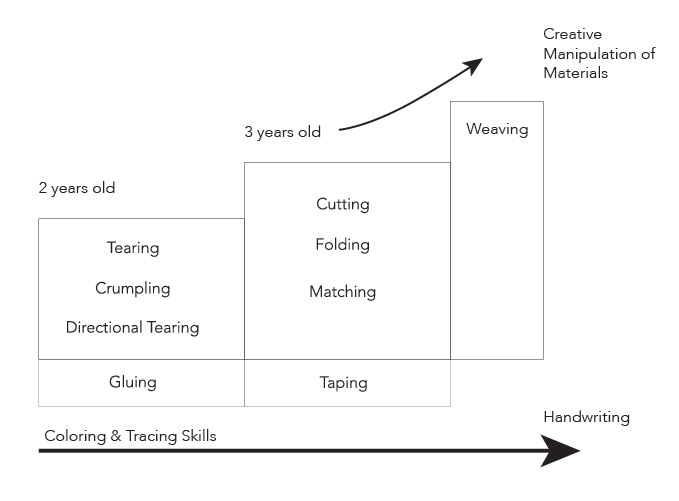 Tearing and Crumpling is therefore a great basic set of skills that lead to more capable scissor use and handwriting at later developmental stages. Identifying like items according to various features. Stick two materials together using a third material with at least one adhesive side.